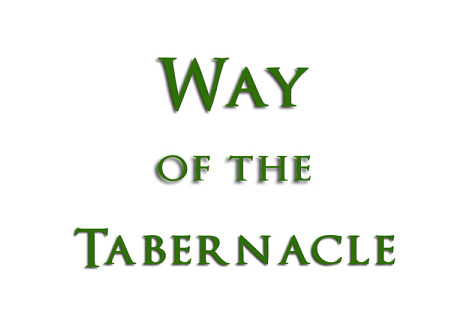 The way of the tabernacle paints a picture of the path to salvation, which is to be indwelt by the Holy Spirit. Priests would enter through the gate, present the sacrifice on the brazen altar, and then purify themselves at the laver (baptism of John). This is where the "church" typically stops in its teaching of salvation; but, like the Samaritans in Acts 8 had done before Peter and John came to them, the churchian model stops short of the most important aspect of this progression, which is entering the Holy of Holies. The lighted menorah, altar of incense, and the bread of the presence in the Holy Place represent guidance and nourishment from the Holy Spirit as He leads the believer into the Holy of Holies, which is to receive the covenant of marriage as Messiah Yahoshua's bride. YOU MIGHT BE A CHURCHIAN IF . . . The thief on the cross manifestly understood the path to salvation better than the highly educated pharisees. He provided the example of what is necessary to be born again, and he received his confirmation of that salvation directly from the Messiah Himself. Over the years since the Holy Spirit circumcised my heart, illuminated my mind, and has compelled me to share His truths with people, one of the most common discussions I find myself in deals with the matter of salvation. Now, understanding all the erroneous teachings of christianity concerning salvation (justification, adoption, being born again, being redeemed, etc. ), it seems that most christians use the same myths about salvation that are almost universally taught in the “church,” but are wholly without true spiritual merit. 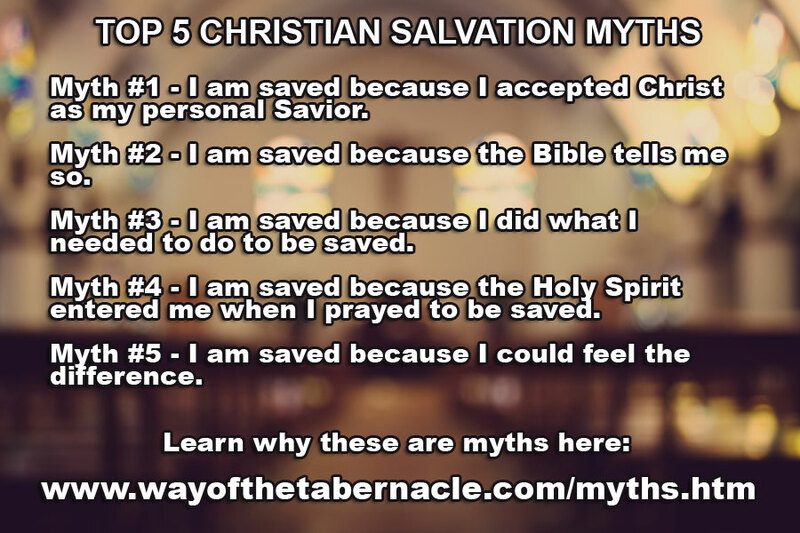 MYTH #1 – I am saved because I accepted Christ as my personal Savior. This is probably the most common answer. But, there is not a single scripture anywhere that says anything about “accepting Christ” as Savior, or into any bodily organ, like a heart. Such statements are pure christianese that come from the emotionalism of christianity, and not from the Spirit of Truth. To state that one must “accept Christ” is to imply that Christ needs acceptance. Christ is Christ, regardless of whether a human accepts Him or not. Moreover, the notion of “accepting Christ” as the basis of salvation puts the means of salvation upon man, or at least man's decision. Man doesn't have the power to save or the authority to declare salvation. Man is told to believe in Messiah Yahoshua and to confess Him before men. That's the extent of what man can, and should, do. Beyond that, salvation is wholly the work of the Holy Spirit at the Father's direction. More here. MYTH #2 – I am saved because of all these scriptures I will now share with you. This is based on the flawed belief that the scriptures can confirm someone has been given the covenant (Holy Spirit). 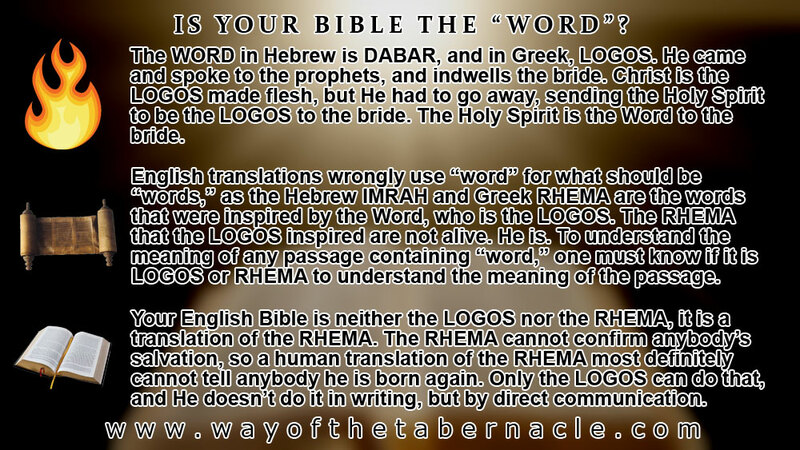 One of the chief reasons for this spiritual error is the deficiency of English translations that make no distinction between the Greek LOGOS “word” (Hebrew: DABAR) and the Greek RHEMA “word” (Hebrew: IMRAH). Both of these have been translated as “word” in the English translations, but are not the same thing. The words of scripture (RHEMA) are not alive—they are words, and the original words (RHEMA) were inspired by the living Word (LOGOS), who to the bride, is the Holy Spirit. Messiah is the eternal Word (LOGOS) of Yah made flesh, but He had to go away because of the wedding traditions, so another was sent in His place to be the Word (LOGOS) to the bride. It is HE who leads the bride into all truth, and tells her of the coming things (John 16:13). Only HE can confirm that someone who has believed has been born again, and He does that personally and directly. There are no words in scripture that can confirm that an individual has been born again. To think so is to idolize the scriptures, giving them the role and authority of the Holy Spirit, which scripture is not capable of fulfilling. More here. MYTH #3 – I am saved because I did what I needed to do to be saved. This, like myth #1, comes from the notion that man is saved by his own decision—his own volition. This myth comes in many common euphemisms, and myth #1 also qualifies here (“accepting Christ), but other very common phrases include “I turned away from my sins,” “I gave my life to Christ,” “I trusted Christ for my salvation,” “I made a decision for Christ,” “I prayed the 'sinner's prayer,'” “I had a new desire to obey,” “I made a stand for Christ,” “I went forward, got saved, and then got baptized in water,” and many, many other equivalent statements. The problem here is that it is based on the idea that man is the one who decides to be saved, but that is completely false. Man is to repent of his unbelief (which is to believe), and confess Messiah Yahoshua before men. That's man's part. It is the Father who then decides when to place His Spirit into the one who has believed in Yahoshua for salvation. So, if your answer to the above question is nothing but things YOU have done, that is not being born again, but is merely the first part of the process. One is not saved until the Holy Spirit perfects a person's belief by indwelling him (circumcising his heart). More here. MYTH #4 – I am saved because the Holy Spirit entered me when I prayed to be saved. This myth comes from another false teaching of christianity—that, at the moment a person believes in Messiah for salvation, the Holy Spirit immediately indwells him. That, again, places the end result of salvation upon man's decision, claiming that it is man's determination that directs the Holy Spirit into him. The Israelites were led by the Holy Spirit to the mountain, and once there, they awaited the giving of the physical covenant. They agreed to its terms before they received it (belief), but it was the Father who chose when to give the covenant. That physical picture is a foreshadow of the spiritual real substance, revealed in those who are the bride. The Holy Spirit leads and guides people out of the world and into belief in Messiah Yahoshua, but once a person believes, it is the Father alone who decides to place His Holy Spirit (spiritual covenant) within the person. In Luke 8:13, Messiah says that some will believe with joy for awhile, but, having not received the root (source of spiritual life—the Holy Spirit), they will eventually fall away. One is only born again once he receives the spiritual covenant, which is the eternal seal of redemption on the bride, and man does not decide when that happens. More here. While this is not used quite as commonly as the others, there are still many who claim that they knew they were saved the moment they made their decision because they could feel it. The problem with this is that, while they likely experienced some relief from the guilt of their unbelief, because they went part way through the "way of the tabernacle," their teachers don't understand the whole process, so they don't actually go the whole way. They identify with the sacrifice (brazen altar) and the cleansing of the laver (the symbolic baptism of cleansing--an invitation to the Holy Spirit), but they are not taught that the High Priest must then light the menorah (giving of the Holy Spirit) for them to go into the Holy of Holies (salvation). They believe for awhile, but then, because they never received the life source (the lighting of the menorah), they eventually fall away (Luke 8:13). Ultimately, many end up trusting the feelings they had to be the determining factor of their salvation, but they did not actually enter into the strait gate (Luke 13:24). Their menorah was never lit, and they never entered the Holy of Holies, and that's mostly because they believe the false teachings of their leaders who don't actually understand the true path to salvation, and who teach that salvation is tied only to the brazen altar and laver (the sacrifice and ceremonial cleansing), but know nothing about the menorah and the the Holy of Holies (the giving of the Spirit of Yah for salvation). More here. Salvation begins with the Passover, just as the physical foreshadow of it did with the Israelites being led out of Egypt after the first Passover, to the mountain, and then to the receiving of the covenant. Apart from the doctrines taught in the Passover Seder, there is no redemption. So, isn't it truly incredible that christianity was built on rejection of the Passover and the Father's other ordained days (Sabbaths)? Even if you have been a christian for many years, START HERE: learn why the Passover is called the Preparation. Watch a Seder, and learn the vast richness in its symbolism. Believe in Yahoshua the Messiah. Take a stand for HIM (Yahoshua) before men. Then wait for the giving of the covenant. When one receives the covenant, he is then a child a Yah, and the Holy Spirit will testify directly and personally to that person that he has been adopted, given the righteousness of Messiah by the indwelling Holy Spirit, and granted the gift of eternal life. Anything less than THAT is a counterfeit of salvation, which is, sadly, what the salvation taught by christianity is. Written by Dean Haskins for Way of the Tabernacle. Reproductions with proper attribution are allowed and encouraged. Do Sinners Go to Heaven? Messiah's Bride Is Not the "Church"
Saturday or Sunday? Does It Even Matter? Will There Be a Pre-Tribulation Rapture? Who Will Testify at Your Judgment? Was the KJV Divinely Inspired?